Also known as Wind Flower, Elfin Swan is an elegant addition to any garden. Those graceful stems produce icy white, nodding flowers from June right through to October. Each flower has a violet-blue underside and a large yellow centre, making these perennials a striking choice for your outside space. 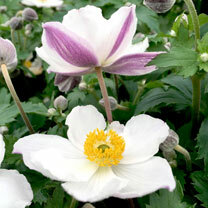 Elfin Swan anemone makes a fantastic specimen and is superb for mass plantings in shady woodlands. Height 30-40cm (12-16"); spread 60-70cm (24-28"). Supplied in a 2 litre pot. Ideal for beds and borders, patio pots and containers. Suitable for cutting. Prefers partial or complete shade.